Expect to see Park Station officers walking through Duboce Park more often. Capt. 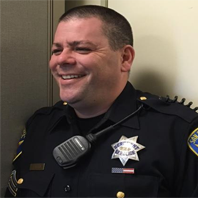 John Sanford, Jr. announced the creation of a new, dedicated foot beat in the Duboce Triangle after four additional officers were assigned to Park Station on March 26. Sanford made the announcement at the Crime and Quality-of-Life Town Hall Meeting at the Rec Center on March 28 and pointed out that they won’t necessarily be available every day since they have days off, vacation time, and training commitments. He introduced one of the two officers on the foot beat, Officer Nathalie Peraza, and Sgt. Carl Ueber, their direct supervisor. Both of them encouraged neighbors to approach them when they see them and to contact them via e-mail them with any concerns. Their emails are Carl.T.Ueber@sfgov.org, Nathalie.Peraza@sfgov.org, and Mikayla.Connell@sfgov.org. A few nights later, Sgt. Nakano, who handles quality-of-life issues at Park Station and is the midnight shift sergeant, walked the Duboce Triangle at night with a few residents, including Friends of Duboce Park board member Mark Scheuer. They reviewed all of the hot spots in the park, especially the ones hard to see at night: the top of the east stairs, the dark west end of the Youth Play Area, the stairs on the south side of the Rec Center, the edges of the park next to residences, and the Scott Street Labyrinth bench and bushes behind it. 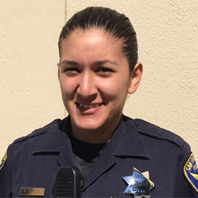 On Friday, the two new beat officers did another walk of the Triangle, again covering Duboce Park. Sanford said that it is important for the officers to know the community and vice versa. 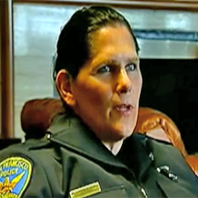 Sanford has definitely given Duboce Park and the Duboce Triangle the foot beat and the attention that we have all wanted for some time and we can expect to see a reduction in crime as a result.